Near the “9 o’clock” portion of the San Juan circle, and less frequently navigated for initial entrance to the San Juans from central Puget Sound, is Mosquito Pass. Navigation though Mosquito Pass is not inherently dangerous, but must be both deliberate and well planned to avoid coming to grief on a reef. Currents are a consideration, especially in the more northern sections of the pass. Unfortunately, the northern portion of the pass requires some agile maneuvering to avoid the shoals and kelp beds near Pole Island. Boaters unfamiliar with Mosquito Pass may be well advised to enter somewhere near high slack. An extra few feet of water under the keel can make a critical difference here, and avoiding periods of peak current will also add an extra margin of safety. Note: The following paragraphs are anecdotal and advisory only. Additional chart work will be required for safe passage. Data from GPS and depth sounders should be considered throughout any transit of Mosquito Pass. Every skipper must plot an individual course and accept full responsibility for the safe navigation and operation of the vessel. Northbound boaters entering Mosquito Pass will typically steer mid-channel between green buoy #1 and Hanbury Pt. Once beyond Hanbury Point, the safe course angles slightly toward the San Juan Island shoreline. About midway between green buoy 1 and green buoy #3, experts often recommend a very small “s” turn, first to the north and then the northeast. The turn should permit a generally northeast approach to split the channel between red mark #2 and green buoy #3. Hazards to starboard in the southern entrance of the pass include kelp and rocks, with shoal water the primary hazard to port. If passing between White and Delacombe Points en route to the popular anchorages in Westcott and Garrison Bays, be mindful to give red #4 sufficient clearance and avoid coasting too closely to Delacombe Point. A reasonably direct turn into the middle of the channel north of Horsehead Bay will be best practice when navigating into our out of Westcott and Garrison Bay. If continuing north up Mosquito Pass, en route to Roche Harbor, leave red buoy #6 well to starboard, being mindful of the Henry Island shoreline and keeping a watchful eye on the depth sounder. Beyond red buoy #6, safe passage is found in the middle of the channel, following a course that curves gently northeast approximately parallel with the Henry Island shoreline north of red buoy #6. Once past the crescent shaped indent to Henry Island, mariners will gravitate toward the eastern portion of the channel in preparation for passing south and east of Pole Island. 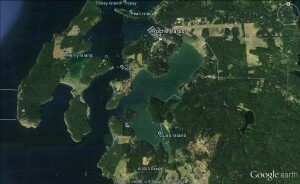 The correct course generally involves heading toward some docks along the San Juan Island Shoreline, and turning sharply to the north only when actually east of Pole Island. So, let’s assume we have managed to leave central Puget Sound and transit one of the passes in the San Juans without going aground in the sound or coming to grief on a reef. Wu-hoo! We’re home free, right? Not quite. In our next installment, we’ll examine a few places within the San Juans where the rocks are covered in bottom paint. Who would bother to bottom paint a rock? Scores of boaters, every summer, who never intended to do so.